Dramatherapy helps to form a bridge between the art form of theatre and the healing power of drama itself. It is about creating drama and fiction as a way to helping people to understand themselves in new ways. The Dramatherapy group, like the rehearsal space, offers permission to play, free from the restraint of text and performance whilst also acting as a container for personal feelings. Dramatherapy provides a creative vehicle for the transformation of feelings, aiding spontaneity and the development of the imagination. It is a creative medium and a space in which to temporarily escape the confines of everyday reality within a safe and permissible environment. Dramatic statements are made through the use of metaphor and symbolic images as a way to extending existing boundaries and to gain insight. spontaneity and the discovery of both personal freedom and boundaries. The objective in a Dramatherapy group is more about the promotion of emotional and physical integration and self actualisation. Through the spontaneous enactment of self in role, it is possible to erase non constructive arid old patterns of behaviour. Because the approach in Dramatherapy is a holistic one, it incorporates forms of expression including non verbal through and of the body, as a way to increasing self awareness and our ability to communicate. Dramatherapy whether experienced in a group or in a one to one consultation, offers an active approach to personal insight within a permissible and supportive environment that encourages and enables the process of awakening and change. Where theatre allows us to look at human issues in new and unexpected ways, Dramatherapy allows participants to experience their lives in new and unexpected ways. 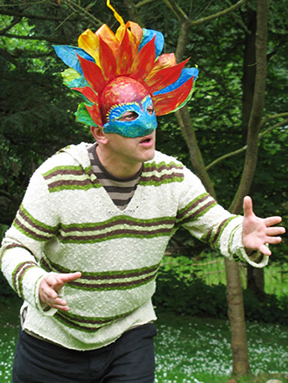 Dramatherapy is fun and aims to explore the creative expressive side of our natures. Whilst there is the option to explore personal issues and experience a greater depth of Dramatherapy, participants are always able to work at their own pace.